Dimensions: 4mm x 610mm(w) X 1220mm(l) - x 10 Sheets Easily convert your glass greenhouse into a safe polycarbonate greenhouse these sheets are simple to cut with a fine toothed hand saw. Or build a timber frame and glaze it with our simple system. These are suitable for the sides of a greenho..
Dimensions: 4mm x 610mm(w) X 1220mm(l) - x 6 Sheets Easily convert your glass greenhouse into a safe polycarbonate greenhouse these sheets are simple to cut with a fine toothed hand saw. Or build a timber frame and glaze it with our simple system. These are suitable for the sides of a greenhou..
Dimensions: 4mm x 610mm(w) X 1550mm(l) - x 6 Sheets Easily convert your glass greenhouse into a safe polycarbonate greenhouse these sheets are simple to cut with a fine toothed hand saw. Or build a timber frame and glaze it with our simple system. These are suitable for the sides of a greenhou..
Dimensions: 4mm x 610mm(w) X 2066mm(l) - x 9 Sheets Easily convert your glass greenhouse into a safe polycarbonate greenhouse these sheets are simple to cut with a fine toothed hand saw. Or build a timber frame and glaze it with our simple system. These are suitable for the sides of a gre..
Dimensions: 4mm x 610mm(w) X 3100mm(l) - x 3 Sheets Easily convert your glass greenhouse into a safe polycarbonate greenhouse these sheets are simple to cut with a fine toothed hand saw. Or build a timber frame and glaze it with our simple system. 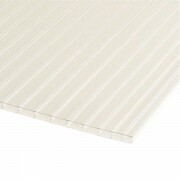 These are suitable for the sides of a greenhou..
Dimensions: 16mm x 700mm(w) x 2000mm(l) - 5 Panels These sheets are suitable for the roof of the greenhouse and the sides if required. Easily convert your glass greenhouse into a safe polycarbonate greenhouse these sheets are simple to cut with a fine toothed hand saw. Or build a timber f..
Dimensions: 16mm x 700mm(w) x 2500mm(l) - 5 Panels These sheets are suitable for the roof of the greenhouse and the sides if required. Easily convert your glass greenhouse into a safe polycarbonate greenhouse these sheets are simple to cut with a fine toothed hand saw. 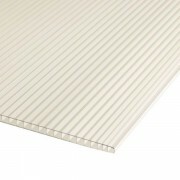 Or build a timber f..
Dimensions: 16mm x 700mm(w) x 3000mm(l) - 5 Panels These sheets are suitable for the roof of the greenhouse and the sides if required. Easily convert your glass greenhouse into a safe polycarbonate greenhouse these sheets are simple to cut with a fine toothed hand saw. Or build a timber f..